With the first breath of spring, comes the talk of spring cleaning. The idea of decluttering and refreshing a home to usher in a new season, in theory, sounds both practical and cathartic. In practice, it’s another matter altogether. I like to straighten and tidy, so that it looks pretty good, but it isn’t really clean. I often complain that if the house is spotless it means I haven’t done a lick of writing. And if I have made some great headway with research and writing, probably no one in my family has had a halfway decent meal. If I spend my days cooking great meals and connecting with my family, the house looks like a construction zone. And then I ask myself the age old question—How do women manage to do it all? 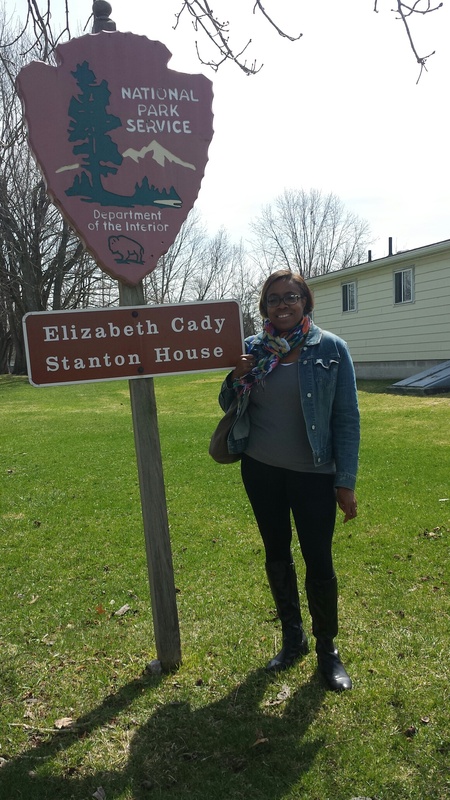 During spring break, when everyone else was heading south to warmer climes, my youngest daughter and I, travelled north to Seneca Falls on what we called our Women’s Rights Road Trip. Other members of my family called it The Nerdy Road Trip, but we wrote them off and packed our bags, excited to visit the birthplace of the suffragette movement and discover more about the these trailblazing women. First stop—National Women’s Rights National Historic Park Visitor Center. Second stop—home of Elizabeth Cady Stanton, one of the founders of the Women’s Rights movement. Elizabeth was an elite, part of a class of women who had servants to wait on her every need. Concerned about her husband’s health and his political ambitions, she packed up her family and moved to tranquil Seneca Falls, NY. But, unlike Boston, where she spent much of her youth, servants were difficult to find in this small, rural town. Elizabeth had seven children, a large home, a husband who travelled quite a bit, and was miles from her family. She had aspirations of her own. Her sharp mind and independent will were dulled by the unending care of a household. She liked to host discussion groups in her home, and entertain abolitionists like Frederick Douglass and William Lloyd Garrison, and her friends Louisa May Alcott and Ralph Waldo Emerson. She wanted property rights. She wanted her daughters to be able to attend college. She wanted the right to vote. But she had kids to care for, a house to clean. I pace up and down these two chambers of mine like a caged lioness, longing to bring nursing and housekeeping cares to a close, she once wrote. Never before had she realized the true plight of most women and mothers of the era, who had no access to hired help. She had never before experienced the delicate balancing act between household, work and family. She didn’t let that get in her way. She hung up her dishrags, rolled up her sleeves and started planning. The way I see it, Elizabeth Cady Stanton hated cleaning so much, she started a women’s rights movement. Now this was a woman I could admire. Amelia Bloomer, who lived in town (and later created women’s pants or “bloomers”) introduced her to Susan B. Anthony (who lived not much farther north in Rochester). She met Lucretia Mott and they sat and talked, maybe while the kids ran around out back and dinner was cooking on the stove and put together the Declaration of Sentiments modeled after the Declaration of Independence . In it, they wrote their demands for equality and shook a nation. It was delivered at the first Women’s Right Convention in 1848. And perhaps, because she couldn’t find childcare, the convention was held not far from Elizabeth’s home in Seneca Falls. While her younger children napped, Susan B. Anthony looked out for the older ones and Elizabeth wrote. When she had dinner parties, she enlisted her children to serve. She let much of the housework go while she planned and organized and helped change the sentiment of a nation. Women are often expected to create and dream while vacuuming rugs and cleaning windows. So this spring, I’d like to offer a warm thank you to suffragettes Elizabeth Cady Stanton, and Lucretia Mott, Susan B. Anthony, Alice Paul, Lucy Stone and Sojourner Truth who taught women and men a little something about priorities. I am waging a movement against spring cleaning. Let the dust bunnies gather. Who has time to clean the toilets when there is work to be done? This entry was posted in Uncategorized and tagged Elizabeth Cady Stanton, Seneca Falls, Susan B. Anthony, Women’s Rights movement. Bookmark the permalink.